Summer is in full swing. In other words it is HOT outside. And the best way to deal with the heat is to go swimming or get wet in someway. 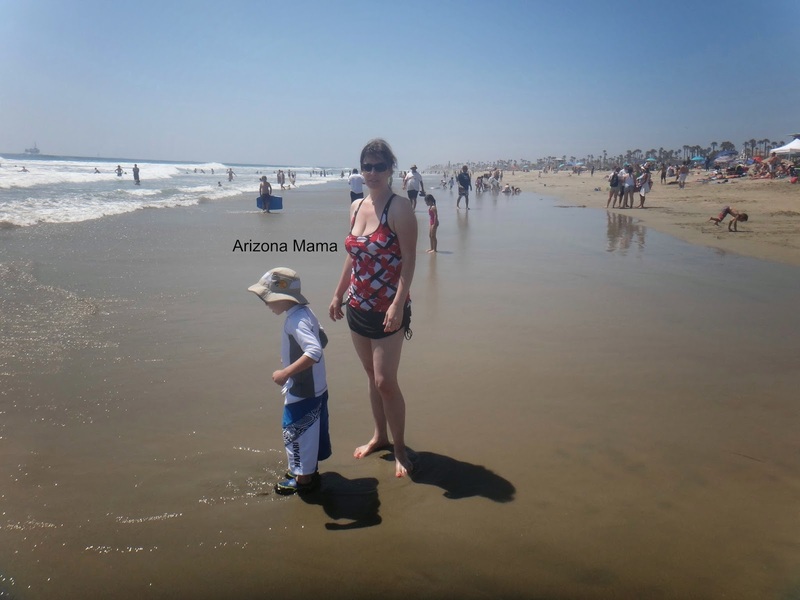 Last week we went to Huntington Beach and it was so nice to hang out at the beach. But in order to go swimming or to the beach you need something to wear. When I was contacted to review Hapari swimwear I was excited. There is so many great suits to choose from. Last year I got the Dolce V-Neck Tankini Top and hot shorts. I still love this suit, but could not turn down the opportunity to try a different suit. I know I prefer a tankini so I started there. There are many different styles of Tankinis to choose from. I had a hard time because I wanted something out of my norm. I finally got it down to a couple of choices. And with a little help from my mom on deciding I picked the Trellis Sport Tankini top. Then I knew I wanted o get the black drawstring swim skirt with bottom. I wanted something different then the boy shorts, but still more coverage then I bikini bottom. The Trellis Sport Tankini Top is a black and white criss-cross pattern that is covered in red flowers. It has a built in sports bra to keep everything in place if your playing volleyball on the beach or just lounging by the pool. The straps are easily converted in any of 3 ways. It is made with 80% nylon and 20% spandex and is 50+UPF. The black drawstring swim skirt with bottom has drawstrings to allow for adjusting the length of the skirt. This is also 80% nylon and 20% spandex with 50+ UPF. I placed my order and to be honest I was a little worried about it getting here on time. We were leaving for vacation in a few days and I had such a hard time deciding that I ordered it last minute. But to my delight it got here in record time. Yes they are based in Arizona, but even the packing took no time at all. I had tome to wash and pack it for our vacation. When it came I noticed it is made with the same high quality as my other suit was. I love the print. 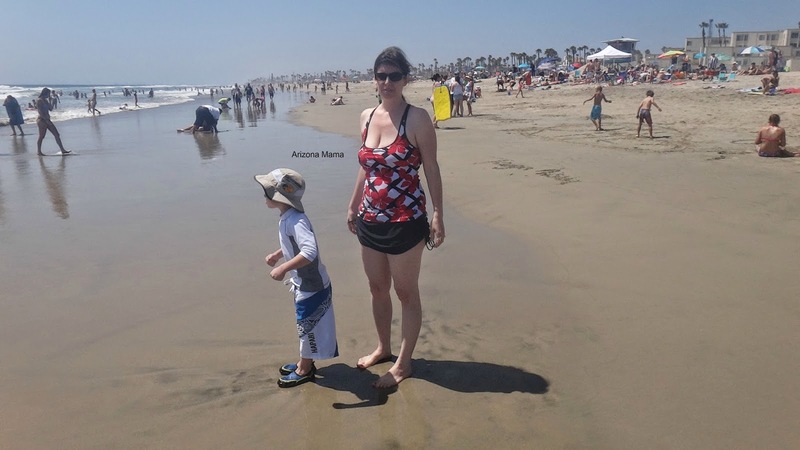 On vacation I dressed for the beach and I loved the suit. It fit great and the straps are easily adjusted and placed anyway you want. I didn't want it to pull on my neck so I had it criss-cross in the back and strap over my shoulders. It was very comfortable. 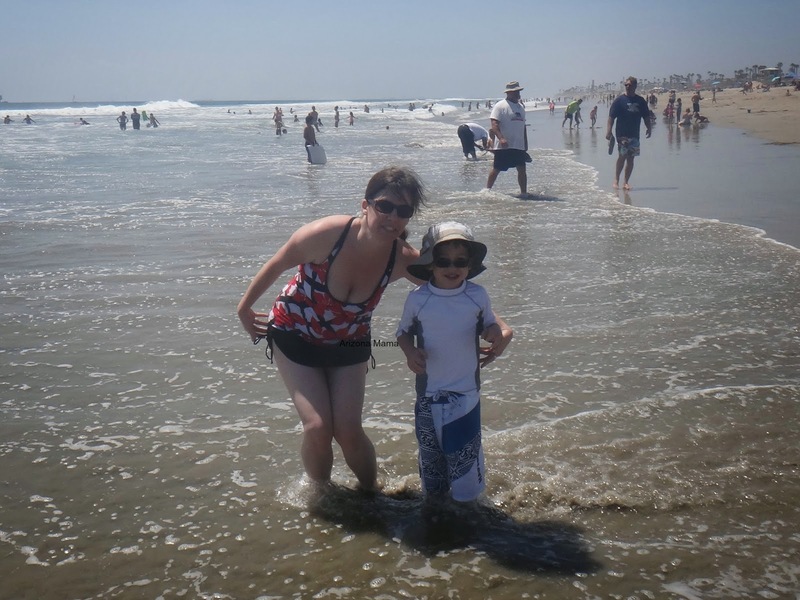 We spent hours at the beach and the suit was great. I never had any problems with it. It fit perfect and everything stayed in place. The bottoms are so cute and can easily be paired with any other top. You might also notice Jayden's shorts are from Hapari. I bought them last year on clearance and I love them on him. I love that they are long and limit his sun exposure on his legs. He says they are very comfortable. I'd get the Carnival Twist Tankini. I would get a BLACK V-NECK TANKINI TOP. Actually, I would get the same swimsuit as you. I like the Red Hibiscus Plus Size SOS Tankini Top and black bottoms. I'd get the denim tile sport tankini top and the white tummy tuk bottoms! i like the Retro Fashion Eyelet String Bikini Top. I would choose the emerald green swirl bandeau top and the matching color bottoms. I would get the MIKADO HIBISCUS V-NECK TANKINI TOP with a black bottom. The Denim Tile V-Neck Tankini Top and the Dream Blue Drawstring Swim Skirt with Bottom are super cute! I would love to get the RED DANCING LEAVES V-NECK ONE PIECE. i would get the black scoop neck one piece! I like the Denim Dancing Leaves Plus Size SOS Tankini Top. I like the plus size black vneck one piece suit. It would flatter me and I like the sleek black color. Id pick the pink desert wave tank in I and the black tummy tuck shorts. I can hardly decide but I would likely buy two of the "sport" style tankinis... thanks. I'd start with the Mikado Hibiscus V-Neck One-Piece Swimsuit! I would get the denim V-neck tankini with matching bottoms. I really like the White Desert Wave Sport One Piece Swimsuit.